The Victoria and Albert Museum, founded in the middle of the 19th century, has, at a single stroke, reinvented itself for the 21st. 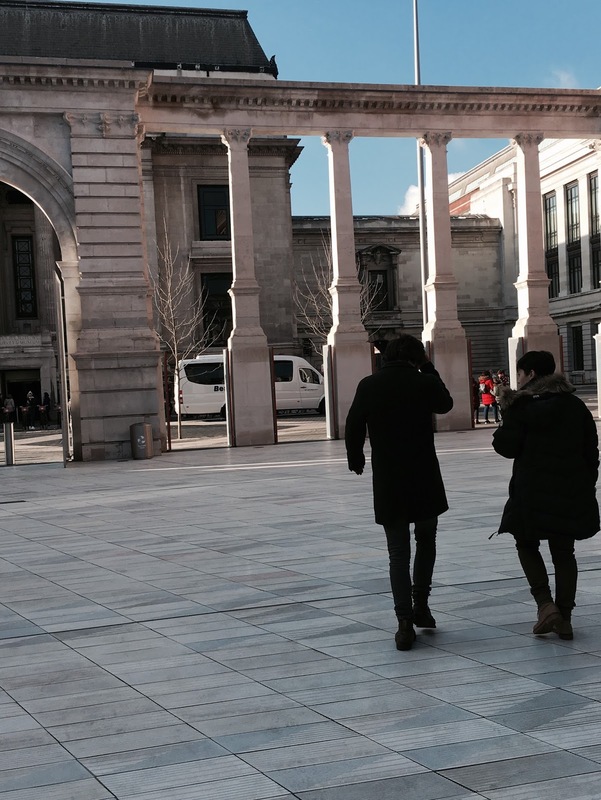 The culmination of an ongoing programme of overhaul and renovation was the opening last year of a new grand entrance in the Exhibition Road. The project was masterminded by Amanda Levete Architects. 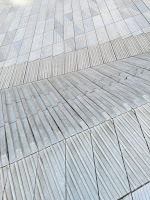 (For further architectural details, see Dezeen magazine.) For visitors to the Museum, the new entrance makes a shining pathway into a much loved museum whose exterior has stood almost unchanged for over 160 years. The firm's principal, architect Amanda Levete CBE, is no stranger to awards (she won the Stirling Prize for her work last year; she has just won the 2018 Jane Drew Prize for women in architecture). 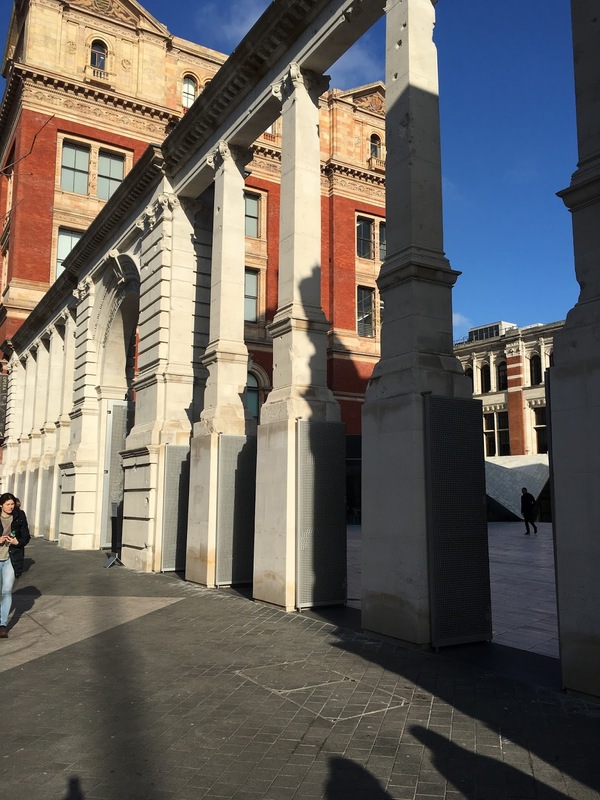 Not only has Levete's firm opened up the entrance to the 1200 sq m Sackler Courtyard within by removing the wall between the limestone columns (see pic) she has chosen a mainly white palette: clay (for porcelain tiles), sand (for glass), marble and white limestone. White reflects light and lets it shine upon the newly exposed western face of the museum. 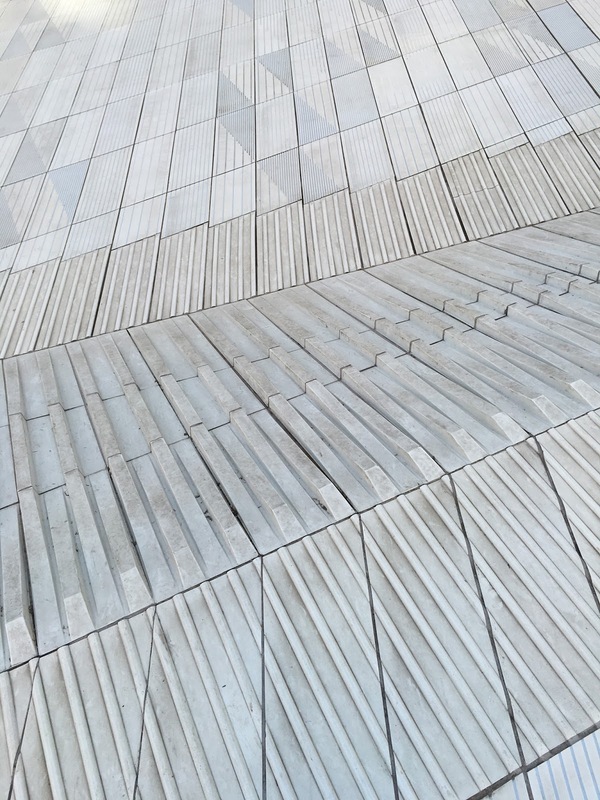 The walking surface of white ceramic tiles is simply stunning, and a beautiful reference to the museum's ceramic collections. The surface of each tile is precisely incised to grip the foot, and glazed to reflect the light (see pic), and made by the Dutch firm Tichelaar. There's a brilliantly positioned cafe to the left as you enter the courtyard. I already know that many architects will sit there letting their lattes grow cold as they take in the clarity of the design outside and watch the Exhibition Road traffic drifting by soundlessly. Uniquely uncluttered, it is the perfect space in which to unwind, clear the vision and prepare to descend the steps and enter the Museum. This is impositional architecture of the most welcome sort, open and inviting. Below ground, extra exhibition space has also been created. The whole represents a new urban topography for this part of London, one that aptly pays tribute to the Geological Museum opposite (see pic) which first introduced London to the history and uses of building stones. In summer the stone will heat up: the tiles will remain cool. Architecture is the fine art here.